These burgers are my favorite way to use my homemade ranch dressing mix . Well, second favorite I guess, next to making the actual ranch dressing for salads. You’ll love how the ranch dressing mix gives these burgers such great flavor! Now that the busy-ness of the holiday season is over and it’s a new year, I’ve been excited to experiment with new simple and healthy recipes to share! 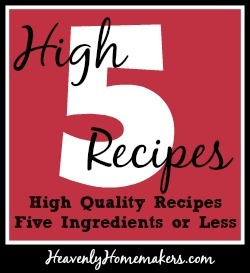 I’ve been spending some time working up more High Five Recipes for us because a simple, healthy recipe with only five (0r fewer) ingredients?! Perfect! These Cheddar Ranch Burgers are SO easy to stir together and cook up for a quick lunch or dinner. My kids (even the ones who usually don’t like meat as much) devour these! Such a fun variation to regular hamburgers! Shape burger into 8-10 patties. Fry in a skillet or on the grill until cooked through and through. These are the bunless burgers shown in the picture. Really, they are delicious with or without a bun! This is great, since I’m often behind in keeping up with making our homemade buns. Be sure to try making this Homemade Ranch Dressing Mix to use in your Cheddar Ranch Burgers…SO easy and good for you! I’ve got several more High Five Recipes in the works! I’ll try to share one every two weeks or so! Question: Are you a ranch lover…or not? I’ve visited with several people lately that just don’t like ranch dressing. What is that about? Do you grill in the winter time? I know lots up north that do. Also, do you pick less lean turkey or venison when you make burgers? I’ve used turkey and it seems to be too dry for me. 85/15 beef works well on the grill but is too greasy in the pan. Tips? Can’t wait to try the ranch mix soon! No, I make these in my warm kitchen in a cast iron skillet during the winter. I usually use grass fed beef for these, but if I used turkey or venison I’d probably fry them in a little bit of butter or palm oil. Turkey will always be dry. You have to stuff the turkey burgers (w/cheese or whatever), and season them well. I’m not a lover of ranch, matter of fact, I’m allergic! Melody – Consider doing a meat “blend” instead. Turkey and venison are both sooo lean that they do not fry well, but if you combine them with some fatty hamburger you can get a happy medium. I find that many people do not care for the texture of ground turkey either, but the blend has enough of the beef texture that they like that. Either way, I think this may fix your problem. I posted a burger recipe on blog today you would love. My experience with people who don’t like ranch dressing is that they’ve never had homemade ranch (even using the packets instead of a homemade mix). The flavor is so much better! Nope, tried homemade. There’s something in both the store bought and homemade that I’m allergic to. And the taste is still horrible. I am a ranch ADDICT! I really need to join some sort of support group :) These burgers look awesome, can’t wait to try them! I love ranch and all our children do, too. We even dip our pizza in it! I used to not like it along with mayo. But now I do. I don’t know why, I guess tastes change sometimes. And these burgers sound delish! I’ll definitely try them soon. I like ranch with of things – veggie sticks, pizza, chicken strips, fries…but not on salads! Not sure why. 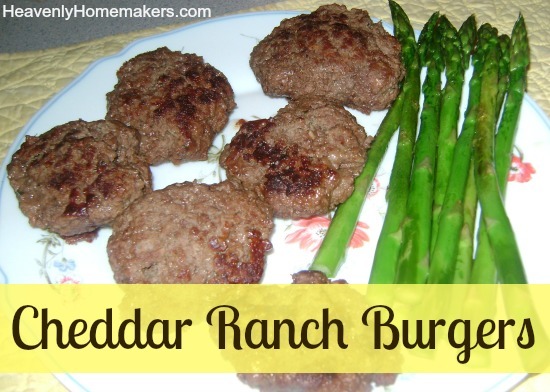 another name… Cheddar SURPRISE burgers. And when they rave about them, tell them the surprise ingredient! I looked at your homemade ranch… I think I’ll try it, all the ingredients I know I’m NOT allergic to. We love RANCH!!! ranch is sooo good on most anything, we dip pizza in it, turkey at thanksgiving gets dipped in ranch, ranch is awesome, will try these burgers this week, thanks laura!!!!!! great burgers. thanks for the recipe. The recipe was a hit in our house tonight! I made it with ground venison … my son asked me to make this recipe again. Both of my kids scarfed it up! I made it with a side of rice and your creamy cole slaw recipe. So are you suggesting to freeze them before they are cooked up or while they are raw? You could freeze them either way. They would be super easy to rewarm if they were frozen after being cooked. Just put them in a skillet with some water in the bottom. Put a lid on the skillet and reheat on low. Made these for my family last night, along with smoked paprika oven potatoes. They were a hit! Thanks for sharing the recipe – and you are right – they don’t even need a bun! Adding these to the menu for this weekend’s campout. Gonna make these tonight! I was browsing online for a good burger recipe and came across one for ranch burgers. We won’t use the store envelopes around here, and I remembered your recipe for dry ranch. I should have come here first! This is the recipe I wanted in the first place. Can I use the dips package or does is have to be the dressing package? Dips package works great too!